Chaugnar Item Builds Guide for Arena of Valor (AoV). Each build is geared toward a different play style, so choose one that fits your personal preference. These items are near necessary to play Chaugnar optimally. Only diverge from them after getting a good grasp of the character and items’ situations. Frosty’s Revenge Frosty’s Revenge is a must have item for Chaugnar. The item provides a bit of additional health to the tank as well as a boost to his movement speed. More importantly, this item gives his damaging abilities an additional slowing effect. This helps him stick to high priority targets as long as he keeps hitting them with Energy Surge and Shockwave. The Aegis A perfect fit for Chaugnar, The Aegis offers large amounts of armor, mana, and cooldown reduction. 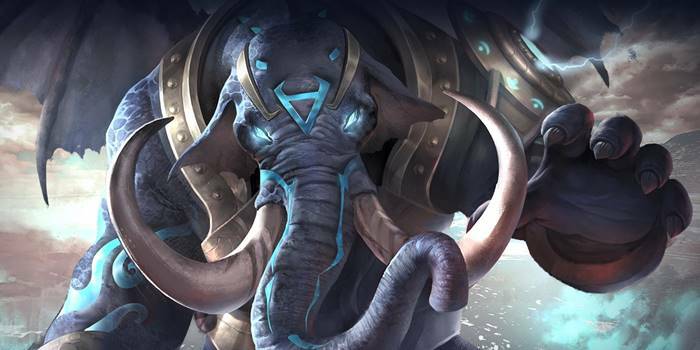 If the stats alone weren’t enough (they pretty much are) the item additionally slows any who would dare attack the majestic chaos elephant, lowering their damage potential and movement speed. Frost Cape Frost Cape is a great item that buffs up defense against physical damage. Moreover, its Frost Power passive grants Chaugnar with yet another slow. After he casts an ability while he has Frost Cape, his next normal attack will slow and deal additional damage. Water Stone Chaugnar nar can find a lot of use in the support items, particularly of the water line. He lines to get close to allies and enemies, causing the aural nature of the items to be a particularly good fit for him. Both items that are built from Water Stone can be good choices, their necessity based on the enemy team’s line up. Orb of the Magi Offering health, mana, and cooldown reduction, Orb of the Magi is a great starting item for Chaugnar. The on-level refresh that it offers can keep him out on the field in between skirmishes as well, allowing him more gold and experience. Buy the item early, however, as it needs time to build up to full power. If lagging behind in farm or needing to move on to his other items, simply grabbing Phoenix Tear and foregoing Orb of the Magi is an acceptable alternative. Soaring Aura Soaring Aura is an offensive item that strips away opponents’ magic defense. This is great for Chaugnar, allowing he and his allies’ abilities to do more damage to nearby enemies. Gaia’s Standard Offering loads of utility to the support, Gaia’s Standard is a great defensive choice. The item provides magic defense first and foremost, offering some durability when facing mages. Chaugnar will find quite a bit more use from the item’s regeneration and movement boosts. The item heals the wearer each time they take damage, allowing them some sustain after scuffles. The movement speed boost is just what it sounds like, but this can be a big help to Chaugnar, allowing him to get near allies in need of cleansing or better aim his Power Surge. Medallion of Troy Medallion of Troy gives Chaugnar further coverage against magic damage dealers. It provides a protective shield that absorbs magic damage every 18 seconds which can be very important to his survivability. The health and cooldown reduction it provides are big helps to Chaugnar as well. Hyoga’s Edge Just like Frost Cape, Hyoga’s Edge provides Chaugnar’s normal attacks a slow. This allows him to stick close to high priority targets while also protecting Chaugnar from their attacks with its impressive defensive stats. Gilded Greaves is a good defensive boots upgrade, especially when dealing with multiple sources of hard disables. Even with his passive and ultimate, Chaugnar can still be stunned when focused by opponents when his abilities are down. Gilded Greaves can help him stave off the control effects thanks to its resistance boost. Sonic Boots Sonic Boots is a good boots choice for Chaugnar. While his abilities allow him to shrug off disables, Chaugnar is susceptible to physical damage. This boots upgrade helps him deal with marksmen and junglers who rely on normal attacks. Here we build up both Chaugnar’s ability power and survivability, coming close to turning him into a magical bruiser. Chaugnar will play similarly to Ormarr with this build, roaming around the map and setting up kills for his team. While stacked on damage with items like Orb of the Magi and Holy of Holies, he won’t be the one finishing enemies off. Enemies will have a very hard time escaping from the elephant, however, Gaia’s Standard and Frosty’s Revenge both speeding him up as he stampedes forward, while Frosty’s Revenge additionally slows down any that get caught under foot. As Chaos Protection and Void Cleanse shorten the cooldowns of Chaugnar’s abilities by flat amounts, he can benefit exceptionally well from a full 40% cooldown reduction, which was our goal here. When under the effects of Chaos Protection, Shockwave will be down to a 0.6 second cooldown and thereby incredibly spammable. We don’t have to go too far out of our way to hit this magic 40% either, Orb of the Magi and The Aegis already bringing the elephant up to 40%. Berith’s Agony seemed like a natural choice for the final 10%, offering some additional durability along with some extra oomph to his abilities. A build that hits the 40% CDR sweet spot while maintaining Chaugnar’s thick skin and potent attacks. The support tank will be able to rush into the front lines of a fight and shake up the enemy time while drawing fire away from his allies. Quickly gets Chaugnar to a place where he can roam the battlefield and support his allies. While lacking the stopping power of more expensive items, Chaugnar will make up for it with an early effectiveness that will allow him to snowball into more expensive items later. That said, these items are still very effective on their own and should give the user a lot of flexibility in fights. Chaugnar will be exceptionally durable with this build, able to withstand large amounts of enemy fire without falling. He won’t be dealing much damage to enemies, but as a support this is far from a huge issue. Instead, Chaugnar will be able to intercept fire and set up kills for his team with his plentiful crowd control. [Added 9/18/2018] Jerryson submits Sun’s build, the DS Laner for the world champion Korean team. Leviathan is there for objective control as well as great stats if you’re able to build up health stacks. The majority of DS Laners will deal physical damage, so there’s a heavy focus on armor, building into Sonic Boots and The Aegis next. Medallion of Troy is there to finally get some magic defense as Chaugnar will be joining team fights at this point, and Berith’s Agony provides that sweet burn damage while boosting his CDR to a full 40%. If the amount of defense wasn’t enough, Blade of Eternity provides a couple of revives. There’s a ton of armor in this build, so if the opponent is sporting multiple magic damage heroes, switch accordingly. [Added 9/18/2018] As if to show just how flexible Chaugnar can be, Kit on team EVOS.Debut debuted this build in the RPL. Now, some caveats: Kit’s team didn’t pick a mid-laner, so only try this build if your teammates give you the go-ahead to play Chaugnar mid. Also, the Tome of the Reaper was in response to an Arum on the opposing team. If there isn’t much healing opposing you, then skip the Tome and move right ahead to Berith’s Agony. In that case, your last item can be Hecate’s Diadem for even more ability power, or something like Blade of Eternity to stay in fights (and take advantage of the +10% damage). Lastly, we recommend using the Execute talent (as Kit did) for this build, as you’ll be in their backline and having the extra burst is crucial. P.S. I realize this is an updated version of your persional tank build, but I feel it’s better largely because it’s cheaper for the support role and provides chaugnar with more gold input that he often lacks when using your build while also allowing him to flex his high movement speed to his maximum potential. Think of it as a recommendation for a more well-rounded build (minus low magic defense, but arcana sets can help mitigate that) if nothing else. Chaugnar OP Build Phoenix Tear sonic boots wind stone optional change Phoenix tear to orb magi berith’s agony Gaia,s standard crimson banner sell wind stone and buy mail of pain. Support hostage and run ???? do the effects of hyogas edge and forstys revenge stack? do they slow the enemy by 45%? Yes, they do stack additively, so would result in a 45% slow. These stack with Energy Surge as well to hit the cap of a 90% slow. I Main Chaugnar and I don’t recall seeing many with this build. But I play on the NA server and it’s not that old, and no real meta has built on it. A more common build I’ve seen is something like Sonic boots, Hercules’ Madness, Frosty’s Revenge, Rhea’s, and sometimes Medallion of Troy, or Longevity. The cost is about 500 higher, but its giving you some hitting power and a couple of shields to help with tanking, letting you really power through your fights. But as always, your road might be different than mine.